Fighting injustice, ending hunger, healing the environment—we can all agree that these are vitally important endeavors, and that they’re only attainable if the whole world comes together to work on them. So it’s wonderful news that last month the United Nations identified 17 goals that will advance the fights against injustice, poverty, and climate change by 2030. Named the Global Goals for Sustainable Development, these 17 objectives may seem lofty, but we believe they’re achievable with the combined commitment of nations, businesses, and individual citizens. As a mission-driven company, Brilliant Earth already works to advance many of the Global Goals, through business practices that help promote justice and environmental stewardship, and with our commitment to donating 5% of profits to help communities that have been negatively impacted by the jewelry trade. We thought we’d highlight five of the Global Goals that relate most closely to the Brilliant Earth mission. We support the goal of ending extreme poverty by working with suppliers who pay diamond and gemstone miners a living wage. Many of the world’s poorest countries possess vast mineral wealth, but too often mining proceeds don’t benefit those nations’ people—there are more than one million diamond diggers in Africa earning less than one dollar per day. By sourcing from countries and mining operations where proceeds are broadly shared with the miners and re-invested in the community, Brilliant Earth helps alleviate poverty. In addition to supporting ethical large-scale mines, we are working to help small-scale (or “artisanal”) miners lift their families out of poverty, through a partnership with the Diamond Development Initiative. This organization works to empower artisanal diamond miners so that they can earn a living wage and make these beautiful gemstones a way to improve livelihoods, rather than a source of suffering. As part of our mission to give back to countries that have been hurt by the jewelry trade, Brilliant Earth plays a part in advancing the Global Goal of equitable access to quality education. 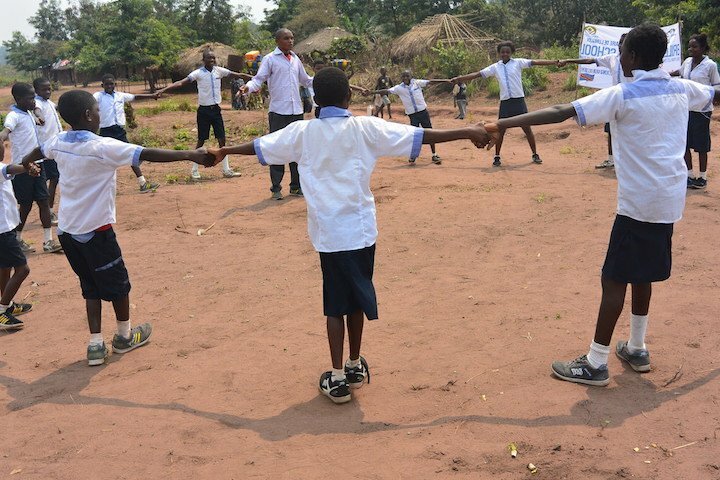 This year saw the opening of The Brilliant School in the Democratic Republic of Congo, a project of Brilliant Earth and the Diamond Development Initiative. Children at the school receive a quality education and free meals, preventing child labor in the diamond mines, and paving the way to brighter futures. We also sponsor scholarships such as the one that sent Fortune Zindi from Zimbabwe to the prestigious African Leadership Academy, and those that allowed handicapped young adults in Madagascar to learn the art of jewelry making. Brilliant Earth advances the Global Goal of reducing waste and responsibly managing natural resources by bringing to market jewelry with minimal environmental impact. Our expansive collection of Vintage Jewelry gives antique jewelry a new life, and by offering lab created diamonds we provide couples the option of a diamond that doesn’t require mining. While gold mining is the number one source of manmade mercury pollution, the recycled gold, platinum, and silver in our jewelry helps protect the earth from the negative environmental effects of new precious metal mining. This Global Goal aims to restore degraded lands, stop deforestation and end the pollution of freshwater and other land-based ecosystems. By sourcing diamonds from mines that follow strict ecological standards, we minimize the environmental impact of our jewelry. As part of our commitment to giving back Brilliant Earth has sponsored the redevelopment of land in Sierra Leone that had been devastated by irresponsible mining. Through a partnership with the nonprofit One Sky and the Conservation Society of Sierra Leone we have contributed to native species plantation, creek restoration, and restoration of lands so that it can be used for agriculture. Tragically, the diamond trade has funded wars and injustices throughout its history and into the present day. Brilliant Earth is helping to put an end to that and work toward the Global Goal of Peace and Justice by selling beyond conflict free diamonds. Most jewelers will promise that their diamonds are conflict-free, but that means only that the gemstones didn’t help fuel a rebel group fighting an established government, and it is a standard that is not well-enforced. Brilliant Earth goes further. Our success over the past ten years has demonstrated to the jewelry industry that there is a robust market for diamonds with ethical origins. What do you think of the Global Goals, and the power of jewelry to help achieve them? Let us know on Facebook or Twitter, or in the comments section!